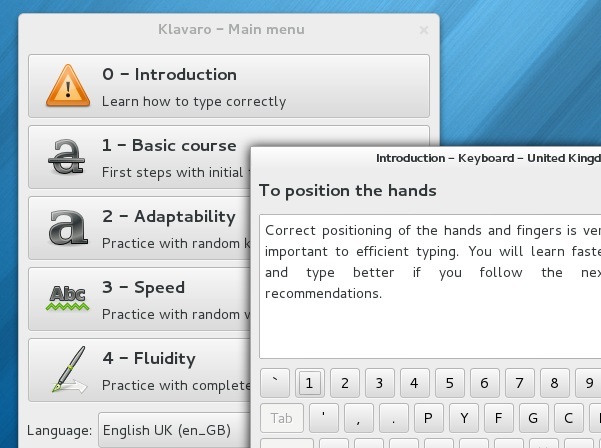 How to Install 'Klavaro' (typing tutor) on Fedora 18 ? How to Install ‘Klavaro’ (typing tutor) on Fedora 18 ? Whether you are new to touch typing or trying to improve it, having installed a decent typing tutor is a must. If you are a GNU/Linux user, there there are a few different ones that you can try. We have ‘TIPP10‘, ‘KTouch‘, ‘nlkt‘, ‘gtypist‘ or ‘dvorak7min‘ (which is specially designed for the ‘Dvorak’ users). Or, if you are looking for a way to improve your typing speed, then ‘Typespeed’ might also help. But, due of its simplicity, features & ease of use, I still prefer ‘Klavaro’. It has well organized lessons (including an introductory lesson that gives you an overview of the correct hand and finger positions etc to courses that help you to increase the typing speeds adaptability etc), supports few major keyboard layouts, view your statics & progress, load typing lessons from text files, readouts the text while you type (can be disabled) and more. Last time I wrote about it concerning the Ubuntu users. So I thought, for those who use Fedora 18 and who haven’t heard of it yet, an article about how to install it in Fedora might come in handy :). ‘Klavaro’ is hosted in the official Fedora servers, therefore installing it is extremely simple. All you have to do, is to open your Terminal window and enter the below command. Once installed, you should be able to run it by searching for it in Gnome Shell. That’s it!. Excellent, lightweight little typing program. I never even knew it existed. Thanks for the tip (and the yum install command).